Our latest song, "Heroes of Angola," will be performed at The Times Center on Friday night as part of Prospect Theater Company's Teen Musical Revue. The evening features original songs based on recent news articles in the New York Times. Our song was inspired by a recent article about an operation in Angola that employs trained Gambian pouched rats to sniff out buried land mines. Articles about squirrels, retiring ballet dancers, and robot dogs inspired some of the other songs in the show. It promises to be a fun evening featuring many talented young performers premiering original work. Come see the future of Broadway! Tickets are available through the Prospect Theater Company website. We are happy to announce that our opera, Ethan Frome, will be given a concert reading at the National Opera Center on May 20th, 2015 at 7:30pm. Admission is free, but seating is limited. The performance will be followed by a brief reception. Please RSVP by clicking the link below. Here's the promo video for AVAC with some background on the show and some shots of our awesome cast. AVAC Memories is being presented by Theatre Now New York as part of the SOUND BITES festival. AVAC Memories, our 10-minute musical about the Roosevelt Island garbage-handling system will have an encore performance as part of Theatre Now New York's SOUND BITES Festival on December 8th at the 47th Street Theatre. The cast features Jennifer Blood, Sarah Corey, Steven Eng, Greg Horton, and Aaron Riesebeck. Dev Bondarin is directing, with musical direction by Jeff Theiss. We're excited to revisit this piece and thrilled to be a part of Sound Bites. The festival is a benefit for TNNY and supports their programming. Tickets are on sale now and can be purchased on the TNNY website. We hope you'll join us for what should be a fun evening of short musical theatre works. 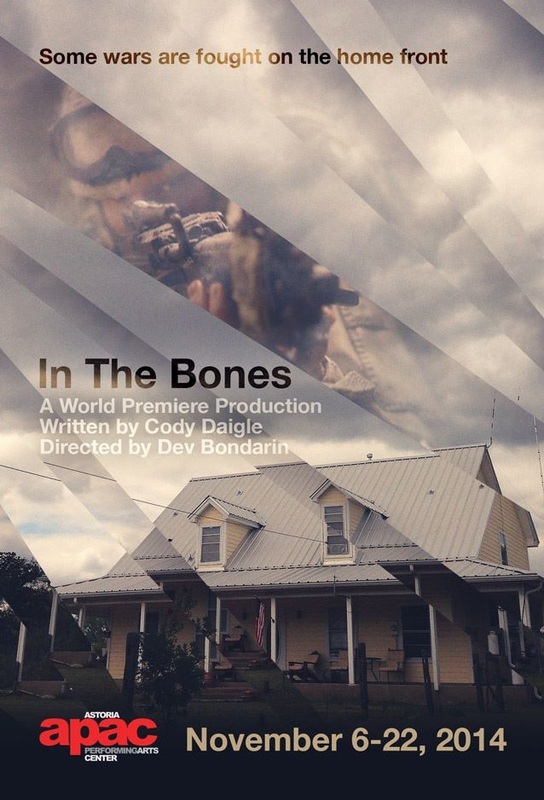 Alden recently composed the score for the world premiere production of ﻿In The Bones﻿, a new play by Cody Daigle, at Astoria Performing Arts Center. This powerful new play, directed by frequent HerinTerry collaborator, Dev Bondarin, is opening this Friday night and running through November 22nd. Visit the APAC website for more details and to purchase tickets. When a soldier home from serving in Afghanistan ends his life, grief settles over his family and the partner he leaves behind. In a series of scenes moving ahead a year at a time, loss transforms a family and sorrow finds a home in the bones of those left behind. Welcome to our new site. Take a look around. Learn about our various projects. Listen to some songs. See what we’ve been up to. We were the featured artists for September's Uptown Cabaret Spotlight at the Indian Road Cafe. The evening was produced by Alexandra de Suze and Eric Vetter and included selections from Ethan Frome, The Tempest, Under the Skin, and an encore performance of Buying Time. The show featured performances by Yiselle Blum, Sarah Corey, Alexandra de Suze, Kristen Gygi, Wes Mason, Rebecca Odorisio, Shelley Ploss, Todd Ritch, and James Sasser with musical direction by Carl Danielsen, Ted Taylor, and Jeff Theiss. Thanks to everyone involved for a great evening!